I find it difficult to write critiques on films that have very little to criticize. Simply putting these films in some historical context seems to be an injustice to how amazingly far they've come. So it is no surprise that many of these films were among the most satisfying of the year. 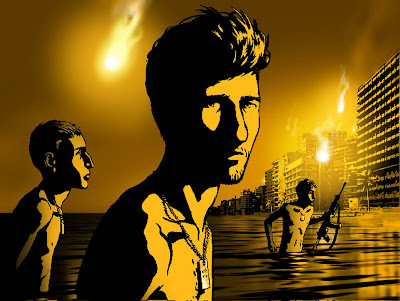 Waltz with Bashir, dir. Ari Folman - The most intriguing of this year's animated films, Bashir is innovative for being a documentary that is presented through the use of animation. I happened to catch it at the New York Film Festival in October, where director Folman explained how only animation could capture the horrors he and his fellow soldiers discuss in their recollections of their involvement as young Israeli soldiers in the first Lebanon war of the 1980s. This because their recollections were now manifesting themselves in horrific surreal dreams. An important film, its only problem is that, like many innovative films, it could get lost in the shuffle come awards time. Neither fish nor fowl, does it get nominated in the animation, the documentary, or the foreign language film category? The Tale of Despereaux, dir. Sam Fell and Robert Stevenhagen - Though largely overlooked at the time of its release, Universal Pictures finally produces an animated film that is strong enough to become a classic. Yes, the movie is a pastiche of many familiar fairy tales. But it is so beautifully drawn, and compellingly voiced by its illustrious cast - Matthew Broderick, Dustin Hoffman, Kevin Kline, William H. Macy, Stanley Tucci, Emma Watson, Sigourney Weaver - that one is reminded that even the Disney classics of yore were forgiven for hardly being original. 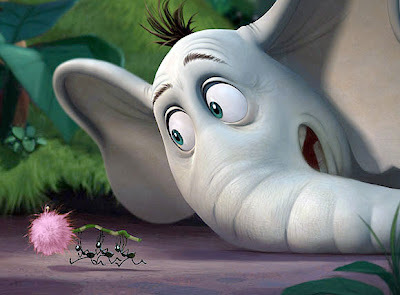 Horton Hears a Who!, dir. Jimmy Hayward and Steve Martino - The only animated film I reviewed this year, not because I thought it was the best - although it was undoubtedly enjoyable - but because I had an easy angle on the piece as it was the first movie I ever took my son to see. The primary showcase here is the onscreen chemistry between its stars - Carol Burnett, Steve Carell, and Jim Carrey - and its fantastic interpretation of Dr. Seuss' spectacularly unique world. This film is a good example of how Pixar's reach will have a significant influence on future animated films. As people leave Pixar to branch out into new endeavors - like co-director Jimmy Hayward (an animator on Finding Nemo) did - Horton demonstrates how other animation companies (in this case, Fox's Blue Sky Studios) will benefit from their experience. Kung Fu Panda, dir. Mark Osborne and John Stevenson - Ah, the joy of seeing beautiful and expressive cinematography and mise-en-scene in a children's animated film. Ignore Jack Black's vocal antics (although it may be hard to), and instead enjoy the lush colors and dynamic framing that makes this film so hard to take your eyes off of. Co-directors Osborne and Stevenson bring their extensive experience in traditional paint-and-ink cartoons to the computer-modeled world of contemporary animation. Wall·E, dir. Andrew Stanton - One of the best films of the year simply for being bold enough to have a near wordless 45-minute opening sequence. From the opening sounds of Michael Crawford belting "Put on Your Sunday Clothes" from Gene Kelly's Hello, Dolly!, to the Rod Serling-like spookiness of seeing a lone robot roaming a dead Earth with the Sisyphusian task of collecting its unrecyclables, this film's opening is haunting enough to overcome its much more conventional morality lesson played out later in its second half. Stanton's ability to express romance between a goggle-eyed robot and his LED-oculared paramour could put many actors to shame. Solid post. It's good to see that people continue to take animated films more seriously, and that they have moved beyond "just kids movies." 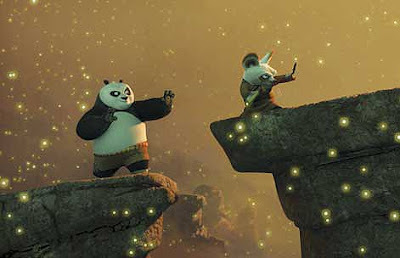 That said, Mark Osborne, the director of KUNG FU PANDA, made an astonishing animated short. I don't know if its what pushed him into the bigger films, but its one of the better animated shorts I've seen. We included it for Out 1's Short Films You Must See. I don't remember if you caught it then or not, so here's the link. I still haven't seen KFP and was pretty middle of the road with DESPEREAUX (although it is certaily beautifully animated) but I'm always glad to see animation get more attention. Here's hoping WALL*E nabs a Best Picture nomination. Seems unlikely, but a robot can dream, can't he? Thanks for letting my readers know to check out this wonderful short. I'll echo James; I'm glad you've done a thoughtful look back on this year's animated films. A few years ago I was thrilled with they added the Best Animated Film category at the Oscars, but now I'm starting to worry it's turning into one of those categories where all animated films will be corralled (like 99% of non-English language films into foreign films) and they won't get the wider exposure and just placement they deserve in other categories. 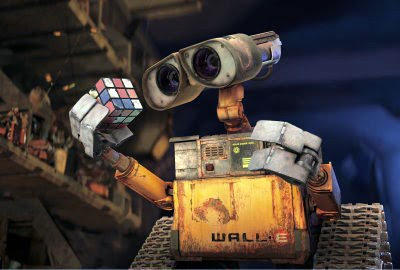 I'm seriously hoping Wall•E does nab a Best Picture nom, but am doubting it at this point. I'm looking forward to seeing Waltz with Bashir and you've convinced me to check out Kung Fu Panda and perhaps the others once they hit DVD. I have yet to see Waltz With Bashir, but I'm interested in doing so. To me Wall-E, or at least the first hour or so reminded me of the old Disney. Bold and experimental. It's good to see Pixar not crank out a bunch of Cars rehashes, even though they could and make a killing doing it. I was in the bookstore and saw a copy of Bakshi's Heavy Traffic and almost picked it up. What animation is missing today is a Bakshi type. An anti-Pixar. It would be nice to see that. True PIPER. Bakshi's satirical influence is sorely missed. I was even fascinated by his brief Saturday Morning take on Mighty Mouse, which of course, soon got cancelled after the character snorted a powder-like substance to regain his powers I think.